Making a heading a Link? On my form, I discuss that they need to fill out a W-9 Form. I want to make the W-9 a link that sends them to our website's form. Is this possible? Yes, this is feasible. 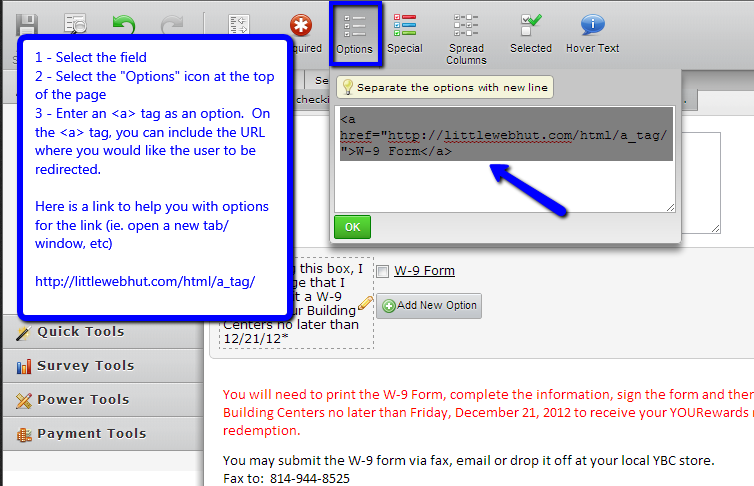 Load the form in the form builder, click the field containing the "W-9 Form" text, in the toolbar click Options and wrap "W-9 Form" in anchor tags like this, replacing http://www.example.com with the URL of the W-9 form. Ok, so the W-9 is not a heading. It's in by a "check box" that you must click in order to submit the form. By the box I have W-9 Form.... I want to make that a link?.. is that possible? Replace [LINKURL] with your W-9 form's URL.